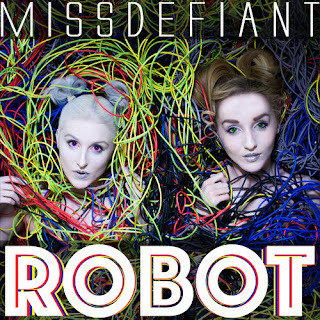 Producing and writing your own music is very common in the industry these days - and the case of London electro-pop duo Miss Defiant is no different. Being a new act on the music scene, Their first release 'Mess With You' was received well, with their ever-growing fanbase anticipating what is upcoming from an act is such a niche genre, the new single 'Robot' is the answer. The track starts with the chorus, "I'm a robot, I'm a robot" which is the perfect way to introduce the first verse, which rhymes "metal' with "kettle" - not lyrics normally rhymed together, but somehow they work in this song. The verses are a little short, but the catchy chorus makes up for it and is the centre-piece of the song. Being their third single, the girls of Miss Defiant have made a great effort (especially with it being self-written and produced), look out for them in future as they go from strength to strength, they should be one to follow in Electro-Pop. You can follow Miss Defiant on Facebook, Twitter and Instagram to see what they're up to and about future releases. They're also performing at Oxjam Festival on October 1st, you can get tickets here. Don't forget to follow me on Twitter, Facebook and Bloglovin' to see what I'm posting next.